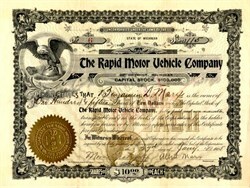 Beautifully printed RARE certificate #6 from the Rapid Motor Vehicle Company issued in 1905. This historic document was printed by the Richmond & Backus Company, Detroit and has an ornate border around it with a vignette of an eagle. This item has the signatures of the Company’s President ( Albert Marx ) and Secretary ( Morris Grabowsky ). The certificate has been folded with minor split on the very edge of the fold. There are only only 3 known certificates from this very important early automoble company. The certificate was issued to Benjamin D. Marx. Max and Morris Grabowsky built their first truck in 1900. In 1902, they organized the Rapid Motor Vehicle Company and began production to build one-ton trucks. This company was the beginning of GMC Trucks. In 1905, Albert North and Harry Hamilton from the Pontiac Spring & Wagon Works (PS&WW) built the first Pontiac Automobile and also acquired control of the the Rapid Motor Vehicle Co. They became key forces in the operations of the company. In 1909, General Motors acquired the Rapid Motor Vehicle Company of Pontiac, Michigan, the predecessor of GMC Truck. A Rapid become the first truck to conquer Pikes Peak in 1909. After the General Motors Company was founded in 1908, it soon became known as one of the largest car manufacturers in the world. In 1909, the Rapid Motor Vehicle Company (GMC) joined with GM. The trade name GMC Trucks was first exhibited in 1912 at the New York Auto Show and was registered with the United States Patent Office eight months later. Now known as the high-end truck-building division of General Motors, the "GMC" in GMC Truck stands for General Motors Corporation. GMC marked their 100th anniversary in 2002 because of the trucks produced by the Rapid Motor Vehicle Company in 2002.